Garage and beat music fans are always fond of digging deep in the vaults of Latin American 60s labels in search for obscure bands to feed their appetite for rare recordings. While most of the unearthed stuff usually consists of cover versions of hits sung in their native Spanish/Portuguese language, we have a totally different case here. 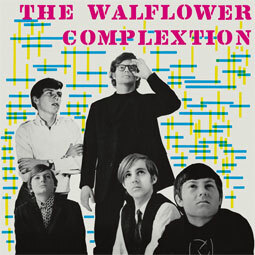 The members of The Walflower Complextion were actually American teenagers, children of US Government staff, attending high school in Bogotá, Colombia. Somehow they got a deal with local label Daro and released their first LP in 1966. The album shows an evident influence of the British Invasion bands, featuring four Stones covers and other classics such as �Long Tall Shorty� via The Kinks, but it is in their own originals and instrumentals where the band showcases the best of their talent. �Blue Bells�, a druggy garage delight, or �Chris�s B�s�, leaning towards early surf music, display the raw sound of this bunch of teens: beautiful vocals, psych guitars, wild drums and tambourines shaken in the background. Although they recorded two albums (only distributed locally) and even appeared on Colombian TV, the band did not last long... They broke up in June 1967 after some of the members finished high school, and little else is known about the next steps in music of Fred and Rick Sampson, Chris Kryzs, Pat Sinex and Mark Lusk. Despite their short career, The Walflower Complextion have gained a cult status among those into Colombian bands such as Los Speakers or Los Young Beats. A must for garage collectors!